Meet Kimberly of @EatSleepWear! She’s a graphic designer and fashion blogger from Huntington Beach, CA. We love her style and can’t help but adore her blue-eyed pup, @lolatheminiaussie. 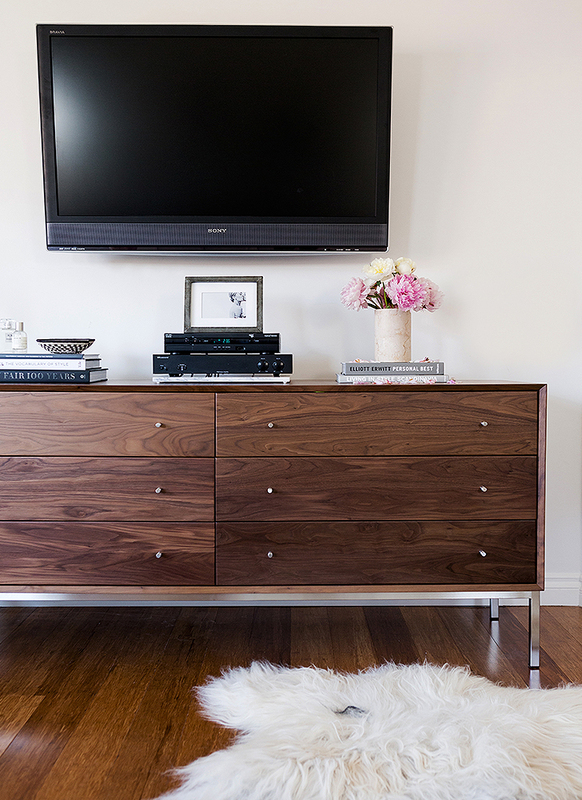 Kimberly worked with Anne of @CitySage to design her master bedroom and transform it into a modern retreat. After seeing the plans for the room, we were thrilled to collaborate to help the vision come to life. 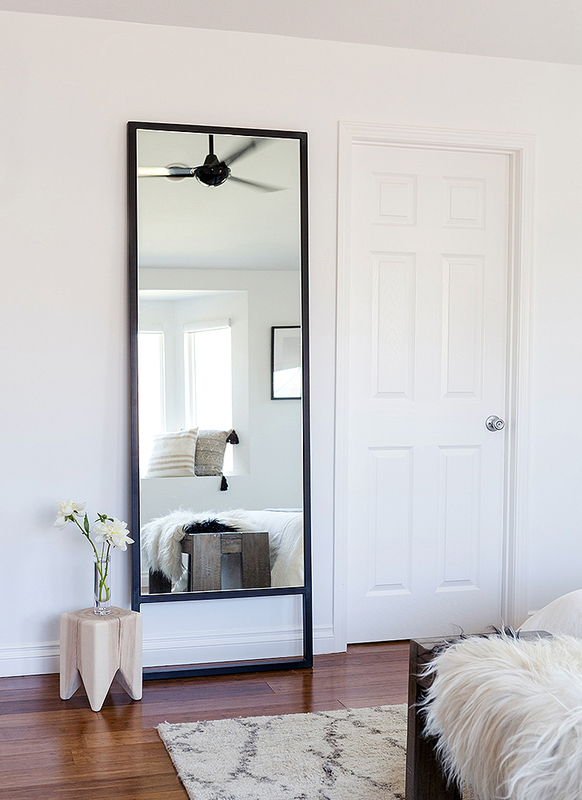 We provided a Soho leaning mirror in natural steel and a Delano dresser in walnut for the space. Head over to Kimberly’s blog for the full reveal and read on to learn more about what makes her tick! My cell phone, chapstick, and a tube of lipstick. Since a big part of my job is social media, I always have my iPhone with me ready to capture the moment or check an email. I am also a chapstick addict and never leave the house without a tub of lipstick in my purse. I have multiples of my favorite shades and keep them in all my purses for a “just in case I need a bold lip” situation. There are so many things that I love about working for myself. I think the biggest thing is that every task and hurdle is my own responsibility. The sense of accomplishment and knowing that the hard work you do directly affects your business is something that is beyond rewarding. I also really love that I make my own schedule. Since I run my own business and as long as I have my camera and laptop handy, I can be anywhere in the world and still be creating content, answering emails, and planning my next editorial. This means I get the opportunity to travel for both work and pleasure and still be on the clock. While not having a 9-5 job is incredible, I would say I work more hours in the day but those hours are filled with passion for creating. Cooking Light. I always seem to pick it up at the grocery store. My husband and I are really into cooking and it’s been one of my favorite sources of recipe inspiration. Another favorite is Porter Magazine. The editorial photos are so dreamy and they are a great source of inspiration for both style, color, and photography. What’s your favorite go-to design resource? Pinterest. What I love about Pinterest is that it’s a resource for all my creative outlets especially when it comes to design. I could search and dive into decor for HOURS on Pinterest. It also helps me to organize my ideas organically and visually. As a visual artist, it’s like seeing a mood board come to life on the screen. How many pillows do you have on your bed? Five. My husband and I each have two king-size sleeping pillows and we have one decorative throw pillow. We used to have more throw pillows on the bed, but in the end, less is more. I love the idea of being able to easily throw one pillow on the bed to really polish it off with ease. Also, my husband hates throw pillows. So this is a compromise that works for both us. A retreat. I think we feel safest at home because it’s a space we have carved out to be ourselves, to be comfortable, and to above all, relax. In my recent bedroom makeover, I made sure to incorporate a reading nook which I call my “zen nook”. Sandwiched in an airy corner of my room, it’s the place where I can curl up with a cup of coffee and a good book and soak in the afternoon sun. It’s a popular corner in our room and there is something about it that makes me feel so relaxed, warm, and safe. My environment inspires me the most. Living in Huntington Beach and live about 5 minutes from the sand. I grew up in the suburbs of Pennsylvania and spent many years living in Philadelphia and NYC. I made the big move to the West Coast and lived in both Orange County and Los Angeles until finally settling down in Huntington Beach. There is something about living on the Coast that soothes my soul. It’s likely the slower pace, salty air, and opportunity to take in life’s smaller moments. A sunset beach walk can inspire me any day of the week. Being lucky enough to have landed here has created a beautiful canvas for creativity and building my life and business together. I love to people watch and with LA only a short drive away, I am able to immerse myself in city or coastal life in a moment’s notice. Head to a museum, or even to a music venue to check out a new artist. The world around me always inspires in so many ways.